It's now traditional that I start a new post with an apology for it being so long since the last one (four months, in this case). I maintain my position that it's better to actually be supporting our Great British Pubs by being in one, than on the laptop at home with a bottle of cheap supermarket-bought (well Majestic, for £1.25 a bottle) beer. So where have I been all this time? Here's a handful of favourites. 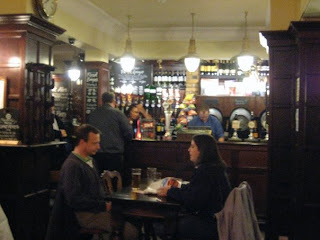 1) The Shashton Arms, Ganton Street. Twitter followers will already know this is my new London residence. The only bad point is that it is somewhat difficult to find, even for airborne traffic reporters who should know better (I mean you, Veglio!) in a maze of Soho backstreets off Carnaby Street. But that's it. It's just two minutes from Meejah Central (ie. Golden Square), yet is a countrified haven of Badger beers. It IS undeniably popular, but they have so many staff on that I've never had to wait to be served, and the landlady is friendly, and well, that's everything you can ask for. 2) The Tiger, East Dean. This is another countrified pub, but this one has the excuse of actually being in the beautiful Seven Sisters country park near Ol' Pa Jackson's place in East Sussex. Its own Beachy Head beers (including the fine Legless Rambler at 5%) and tables looking out on to the prettiest village green make this the perfect place to take three generations of Jacksons to meet my friend Carina. 5) And an honorable mention for the King's Head in Orford, Suffolk for just being a lovely village pub, with a mix of friendly locals, Adnams ales, up to five dogs of all sizes in the bar at any one time, and some excellent food. A model of how to do it right. If you can remember any other pubs I've been to and should have written about at the time, then do let me know, via an electronic mail communication, as the Chelmsford post is on strike. 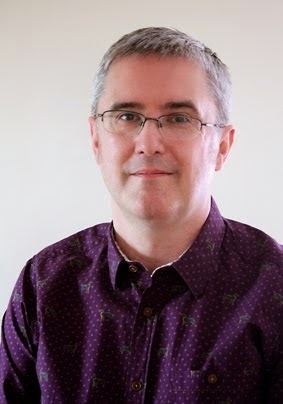 And now that you've read this, go to this beery blog which puts mine to shame and just gets better and better: Stonch's Beer Blog. Given our travels - well documented on these, er, pixels, it's now rare that I get to go to somewhere I haven't been before in central London - and rarer still that it's only a couple of minutes walk from Liverpool Street. So I was excited to read about Stone Horse and Paper Cow, owned by the same company as the well thought of Balham Bowls Club and also now the Tooting Tramshed. Although the address is Bishopsgate, it's tucked away down a side alley next to the Heron Tower building site - and either it's difficult to find or the credit crunch has hit those City boys REALLY hard, as it was pretty quiet on a Thursday evening. Anyway, there's a shop front, you walk down the stairs, through a net-curtained door, and there's a long bar in front of you, with the usual mis-matched salvaged furniture. What you're not expecting is that down the far end, there's a whole further room, with a couple of pool tables and some nice US-style booths. It's a big ol' place. There's even a couple of proper ales on tap, including Pure Ubu. However, what let it down for me was the bar staff, who were so busy cleaning the bar when I arrived that I was left standing there until I shouted "hello" at one of them. They were then all called over for a chat with the manager, who gave them the standard "don't be generous with the measures, be careful when you pour a pint" message that bar-staff everywhere will recognise from the day after a stock-take's been done. And then on the second round, the barman wasn't aware of the work of "lager top" and couldn't find the orange juice button on the till. If they can get that sorted though, this will do a good job as a modern-day recreation of the sadly-missed Throgmortons. Meanwhile, I've been back to Shunt a couple of times, and there's mixed news. I went there once on a Friday night, stayed later than expected, and was worried it had jumped the shark. It seemed to have lost its artistic quirkiness and have become a standard bar full of Shoxton types with asymmetrical haircuts talking about how cool it was to be there. And that's not cool. Couple that with rumours of its demise, and I was ready to take to the blogwaves and pronounce it as "so 2008". Then I went back, earlier on a Thursday evening, and normal service had been restored. There were tasty snacks on the bar, and thirties tunes on the PA, and all was well. I've even had a mailer to say that while there IS a new Shunt space in Bermondsey, the Lounge remains open until at least July, albeit with a slightly smaller space. And in Chelmsford news, Garders and I decided to go townie and do a crawl of the High Street chains. No, I don't know why, but it seemed like a good idea at the time. 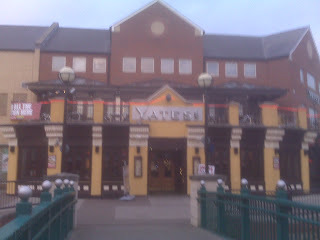 I'm pleased to confirm that Yates Wine Lodge is every bit as terrible as I expected. The barmaid appeared to have Swine Flu, and I think she even managed to cough in my pint of John Smiths Extra Cold - although the place is clearly set up more towards the Corky's Toffee Vodka Shots market. 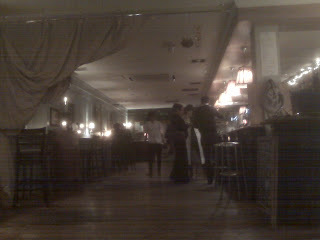 Edwards was marginally better, but only because the barmaid was fit (as in healthy, of course!) 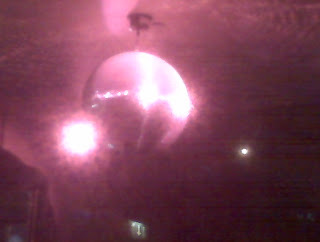 and there was a glitter ball, which made me feel like I was in the studios of Heart. 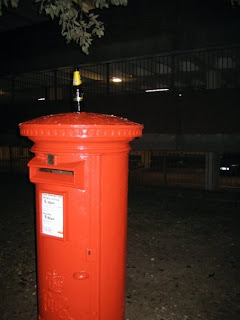 Finally, The Ivory Peg from Wetherspoons is let down by being a nasty square box of a room next to a bus stop, but gets an honorable mention for (a) having a very nice smoked beer on draught as part of its real ale festival, and (b) being cheap. 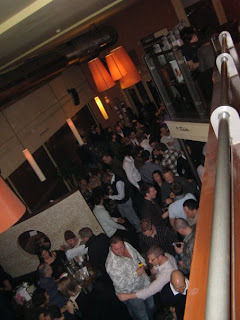 Other bars are also available. Use them. Well hello there... it's been a while! This is due to a greyhound and a digital radio station both being far more work than you'd think. But enough of the excuses and on to the pubs. So last night I finally managed to prize myself away from the poopscoop and the Blackberry (there's a joke somewhere about both devices being full of something, but we'll leave that) for just long enough to join Big Garders for an evening of beer in the Jodie Marsh-land of Brentwood. There's been many changes since I lived here ten years ago. The White Hart is now "Sugar Hut Village", and the legendary Sam's Nightclub is now a swanky bar called Eclipse, which claims to be "taking pleasure to another level". But the High Street still makes for a fine crawl, and it was time for Garders and I to inspect. We'd planned to start in the pub closest to my arrival at the railway station - after all, why waste a minute of VDT - Valuable Drinking Time. But while on the train, I got a call from Garders to say he'd been in and it was "a bit lively" as "there's some sort of football thing on". He demonstrated a similar mastery of Association Football to mine I'm sure you'll agree - and given the pub in question was Murphy's Sports Bar, the "liveliness" was not entirely surprising. So next nearest up the hill from the station is The Brewery Tap. As far as I could see, this was not actually a brewery tap - but was a nice, friendly traditional locals pub. It was busy, but not crowded and Stoke v. Liverpool was just finishing on the flat screen tellies that seemed to be on every wall. I think they'd got a bulk-buy discount at Currys. 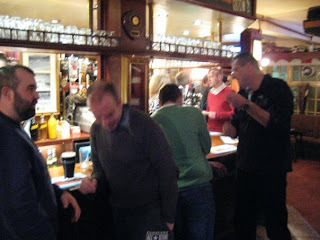 Anyway, it served its purpose - a nice warm-up pint of Spitfire before setting off for the High Street. So to The Swan, which I think is a Greene King pub. 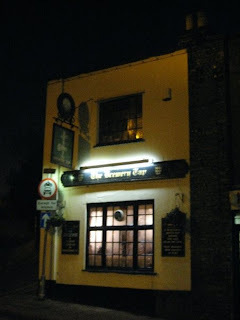 It's a nice pubby place, with cheery staff and the usual GK real ales supplemented by beers from barrels behind the bar - I had a couple of fine pints of Olde Trip. Sadly however, no sign of a Wetherspoon-esque 99p pint here yet. And it's by far the best of the High Street pubs, although that's not a particularly challenging task, particularly given it's next door to the hideous Litten Tree, known locally as the Litter Tray - which is precisely the polar opposite of The Swan, swilling out alcopops to hoodies who look barely old enough to drink legally. 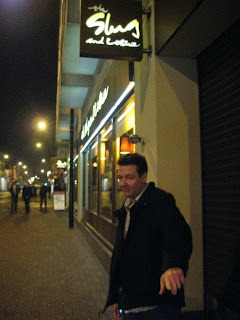 The final stop was the good ol' Slug and Lettuce. Not normally my bar of choice, but it's always worth a visit when in the 'Wood. This is where the orange Jodie-alike girls and cashmere-sweater-clad Mark Ronson-wannabee boys come to warm up before Sugar Hut and is always worth seeing (and just staring). You don't come here for the beer (John Smiths for me, Becks for Garders) - but amazingly for these supposed credit-crunch times, despite having plenty of hard-working bar staff, they just couldn't serve it up fast enough for the thirsty people of Essex, and the bar was crowded with people waving notes. 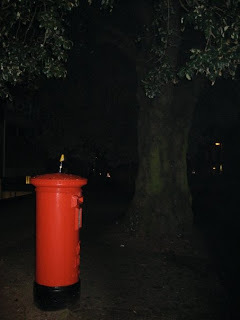 Then on the long walk of shame back to the station, here's a sight that I though best captured what it means to be English in 2009 - a mighty old oak tree next to a traditional red post box. With an empty Cobra bottle (which, I hasten to add, was not mine!) perched on top. Makes you proud. To see all the photos from our Big Brentwood Bash, push the red button now.